At the end of the day we’re all seeking more happiness. 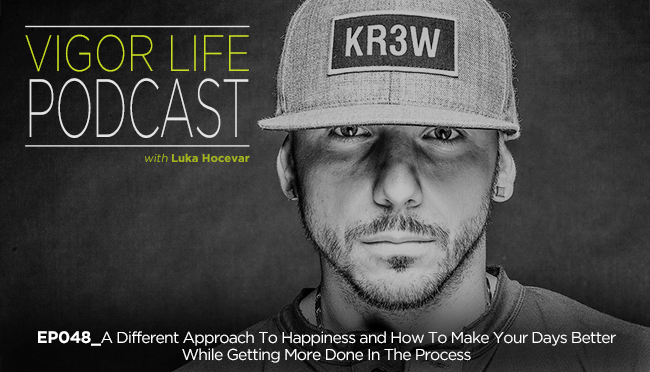 In this episode I share the secret to how you can significantly increase your happiness level, while teaching you how to become more productive and successful at the same time. If you struggle to find happiness in your day-to-day life and would like to increase your productivity so that you can drive your career further and create more impact and profit, this is the episode for you. This entry was posted in Podcasts and tagged Business, Entrepreneurship, Happiness, Life, Mindset, Motivation, Personal Development, Podcast, Self Development, Self Help, Success, Transformation, VigorLife. Bookmark the permalink.